Create a Partial CUI file. (option) Add toolbox(es) in a Menu Group. In the File menu, choose Create new partial CUI file ... .
Place the cursor on Menu group, then right click an choose Create new partial CUI file ... in the context menu. The Create a Customization File dialog opens. By default the new partial CUI file will be created in the Support folder of the Roamable root folder. 2. (option) Select a different folder to save the CUI file. 3. Type a name for the new CUI file in the File name field. The newly created Partial CUI file is loaded and a Menu Group of the same name is created in the Menus tree, Toolbars tree, Keyboards tree and Available Tools tree. 1. In the Customize dialog select a menu group. 2. 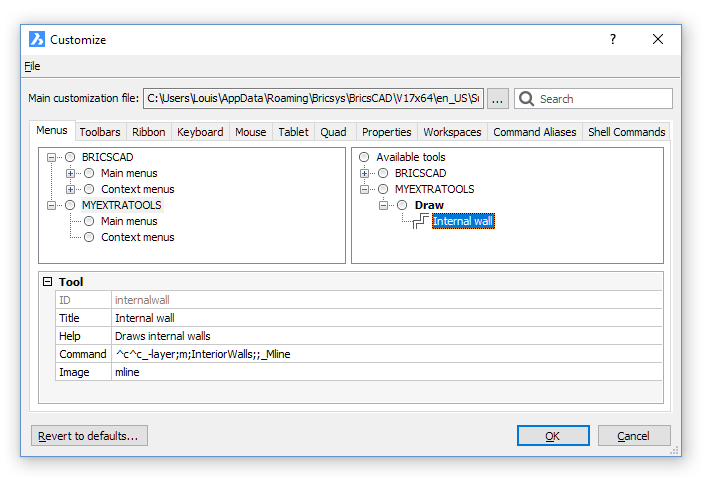 Right click and choose Append toolbox in the context menu. 3. 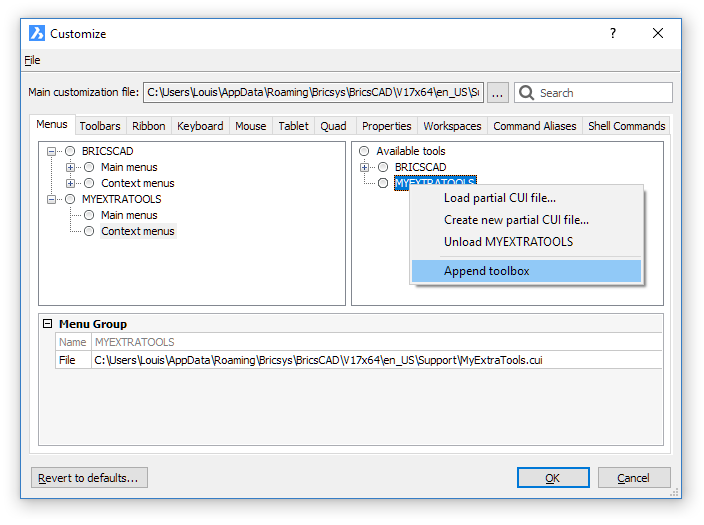 Type a name for the new toolbox in the Title field of the Add toolbox dialog. The toolbox is added in the Available Tools tree. 5. Click the Apply button to save the definition. 1. In the Customize dialog select a toolbox in the Available Tools tree. 2. Right click and choose Append tool in the context menu. The Add tool dialog displays. 3. 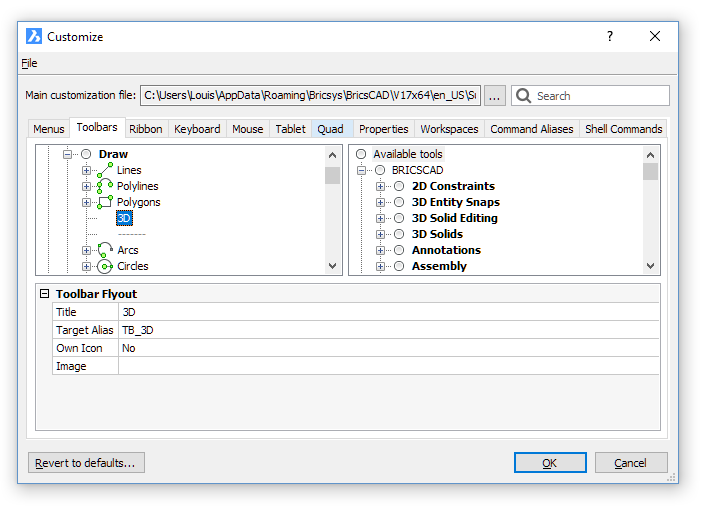 Type a name for the new tool in the Title field of the Add tool dialog. 4. (option) Type a help string in the Help field of the properties grid. 5. Type a command or command macro in the Command field of the properties grid. 6. Click the Browse button ( ), then select an image for the new tool. Select Builtin , then choose one of the built-in icons. Select Bitmap file , and choose a bmp, gif, jpg, jpeg or png image file. The tool is added in the toolbox. 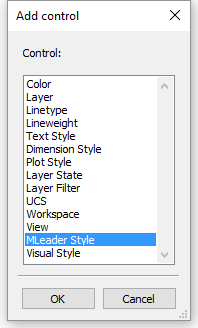 In the above example the Command field contains a macro that makes the InteriorWalls layer current, then launches the Mline command. If the layer does not exist yet, it is created first. ^c^c is the equivalent of pressing the Esc key twice, which first ends a running command if necessary. an underscore (_) in front of a command name ensures that the macro still works in a non-English version of BRICSCAD. a point (.) in front of a command name ensures that the macro still works if this command is temporarily undefined (see the UNDEFINE and REDEFINE commands). a minus sign (-) in front of a command launches the command line version of a command, thus preventing the command dialog window to open. a backslash (\) waits for user input, e.g. specifying a point. 1. In the Customize dialog click the Menus tab. Click the Main Menus subgroup of the menu group, then right click and choose Append main menu in the context menu. Select an existing menu in the Main Menus subgroup, then right click and choose Insert main menu in the context menu. New menus are added above the selected existing menu or as the first menu if you select the Main Menus subgroup. 3. Type a name in the Title field of the Add main menu dialog. 5. (option) Repeat steps 2 through 5 to add more menus. 6. Click the Apply button to save the definition(s). The new main menu is not added to the Menu bar until at least one menu items is added to it. 2. If collapsed, expand the menu group (e.g. BRICSCAD). 3. If collapsed, expand the Main menus group of the menu group. Select the menu, then right click and choose Append submenu in the context menu. Select an existing item in the menu, then right click and choose Insert submenu in the context menu. New submenus are added above the selected existing item or as the first item if you select the menu. 5. Type a name in the Title field of the Add submenu dialog. Select the Context Menus subgroup of the menu group, then right click and choose Append context menu in the context menu. Select an existing context menu, then right click and choose Insert context menu in the context menu. 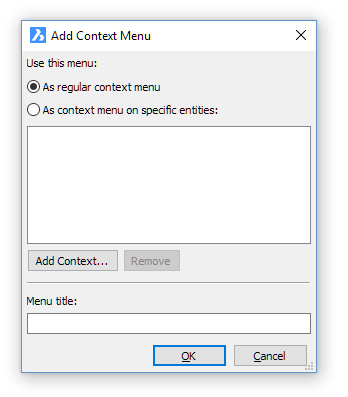 New context menus are added above the selected existing context menu or as the first context menu if you select the Context Menus subgroup. 3. Select a menu in the menu list of the Add context menu dialog. 4. (option) Select As regular context menu , then click the Add Context... button. 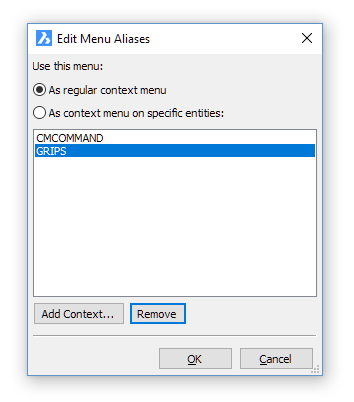 CMCOMMAND: to replace the default Command context menu. CMDEFAULT: to replace the default Default context menu. CMEDT: to replace the default Edit context menu. GRIPS: to replace the default Grips context menu. 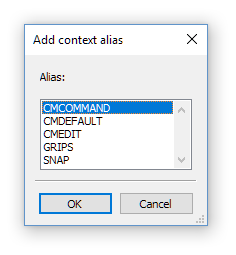 SNAP: to replace the default Entity Snap context menu. Optionally repeat the previous step to add another alias. Select an alias, then click the Remove button to remove the alias. 5. 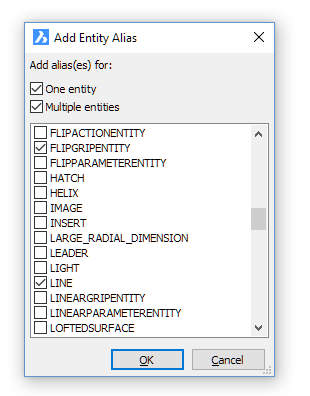 (option) Select As context menu on specific entities: , then click the Add Entity Type(s)... button. Check the One entity option: the context menu applies if one entity is selected only.. Check Multiple entities : the context menu applies in multiple entities are selected only. Check both options: the context menu applies if one or more entities are selected. Select one or more entity types in the list. 6. Type a name in the Menu title field. 7. Click the OK button to save the context menu. 8. (option) Repeat steps 2 through 5 to add more context menus. 1. In the Customize dialog click the Toolbars tab. Select a menu group, then right click and choose Append toolbar in the context menu. Select an existing toolbar in a menu group, then right click and choose Insert toolbar in the context menu. New toolbars are added above the selected existing toolbar or as the first toolbar if you select the menu group. 3. Type a name in the Title field of the Add toolbar dialog. 5. (option) Adjust the Toolbar properties. Title : The toolbar name must include alphanumeric characters with no punctuation other than a dash (–) or an underscore (_). The Title along with the Alias enables the toolbar to be referenced programmatically. Position : Defines the display position of the toolbar when the CUI file is loaded. The options are: Floating , Top , Left , Bottom or Right . The latter four refer to the window edge where the toolbar will be docked. Display : Defines whether the toolbar displays or not when the CUI file is loaded. Rows : Specifies the number of rows when the toolbar position is floating. View bars with controls cannot have multiple rows. Xval : When the position is Floating, specifies the X coordinate in pixels, measured from the left edge of the screen to the left side of the toolbar. Yval : When the position is Floating, specifies the Y coordinate in pixels, measured from the top edge of the screen to the top of the toolbar. The new toolbar is loaded only if the Display property is set to Show . See Opening a Toolbar for more information on opening toolbars. Select a toolbar, then right click and choose Append Flyout in the context menu, to add the flyout at the end of the toolbar. Expand the toolbar, right click a tool then choose Insert flyout in the context menu, to add the flyout above the selected tool. 4. 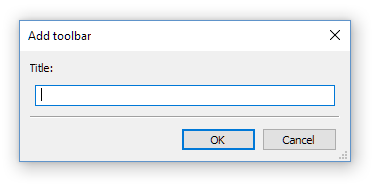 Type a name in the Title field of the Add flyout dialog, then click the OK button. Click the Target Alias field, then click the settings field and select an existing toolbar in the drop-down list. Add tools to the new toolbar. Select the toolbar, then right click and choose Append control in the context menu. The new control will be added as the first item in the toolbar. Select an existing item in the toolbar, then right click and choose Insert control in the context menu. The new control will be added above the selected existing item. 4. Select a control in the Add control dialog. Type the width in pixels in the Width field. Type Default or 0 (zero) in the Width field to restore the default width of the control field. 1. In the Customize dialog click the Keyboard tab. Select the menu group, then right click and choose Append shortcut in the context menu. The new shortcut will be added at the end of the shortcut list. Select an existing shortcut in the toolbar, then right click and choose Insert shortcut in the context menu. The new shortcut will be added above the selected existing shortcut. Proceed with the Add an existing tool procedure. Proceed with the Add a new tool procedure. 5. In the Properties grid of the new shortcut select the Key field, then press the key combination you want to assign to the shortcut. 1. In the Customize dialog select the item you want to add an existing tool to. 2. In the Available Tools pane, expand the toolbox that contains the tool you want to add. Drop the tool on top of the item name to append the tool. Drop the tool on top of another tool to insert the new tool above the existing tool. 4. (option) Edit the tool in the settings grid, e.g. to add a diesel expression in the Diesel field. 1. In the Add dialog choose Create new tool. 2. Select the Toolbox in which you want to create the new tool. 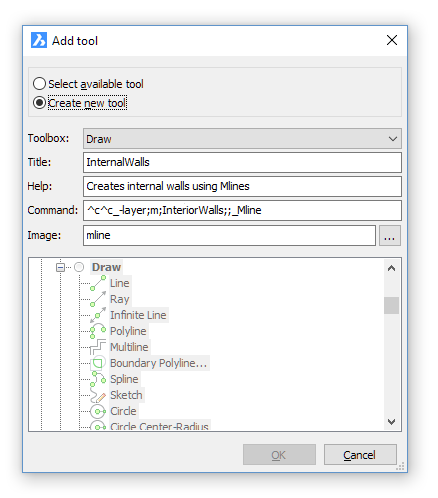 In the screenshot above the Command field contains a macro that makes the InteriorWalls layer current, then launches the Mline command. 7. Click the OK button to create the new tool. 1. In the Customize dialog select the menu or toolbar. Drop the tool on top of the item name to move it to the last position. Drop the tool on top of another tool to move the tool above this tool.